This report, the third in the Technology at Work series, focuses on the automation driven by e-Commerce for physical goods. We look at the technology needed to automate order fulfillment, inventory management, and delivery when consumers shop online and examine the implications in a wide range of areas for industry, retailers, supply chains, real-estate, and transportation, looking too at the impact on labor and employment. Growth in e-Commerce is the main driver of warehouse automation, a driver which itself will increase with broadband and mobile device penetration. In Japan, 32% of all goods bought on the Internet were bought on smartphones in 2016, up from 27% a year earlier. Millennials, those most likely to shop online, will soon enter their peak spending years. Global e-Commerce sales have grown at a compound annual growth rate of 20% over the last decade, and online retail sales have gone from ~2% of total to ~8%%. While technology is not yet either capable or cost effective in all cases, this is likely to change. Our estimates show that that 80% of jobs in transportation, warehousing, and logistics are susceptible to automation as a consequence of the trends we observe in technology. Retail is one industry in which employment is likely to vanish, but unlike manufacturing jobs which are highly concentrated, the downfall of retail employment will affect every city and region. U.S. companies employ 2 million people just to do stock and order fulfillment work and over 90% of warehouse picking is currently done by hand. 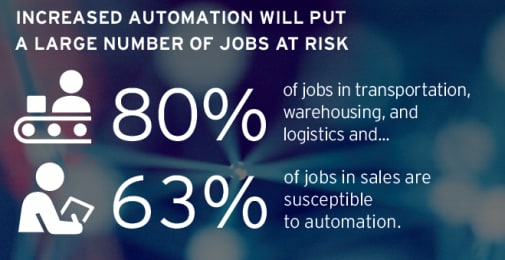 Migrating to automated picking gives productivity gains of 2x–3x that as compared to pick-to-conveyor operations and 5x–6x as compared to manual pick-to-pallet fulfillment centers. The adoption of technology is by no means uniform. While one-hour delivery is available when buying online in some parts of the U.S. and Europe, the average promised delivery time in Brazil is nine days. While e-Commerce penetration is 87% in the U.K., it is only 18% in Romania. By end industry, penetration is highest in clothing and sporting goods. The virtual world is also subject to physical constraints. Warehouse availability is now at an all-time low in the U.S. and land availability for warehouses is already a problem in London, where 60%–70% of industrial sites sold are “lost” to residential development. Online business models need 300% more warehousing space compared to store-based fulfillment. Based on forecasts from Euromonitor for global e-Commerce growth, over 2.3 billion square feet of new warehousing space will be required by 2035. Road traffic is a challenge too — kilometers traveled by light goods vehicles in the U.K. were 47% higher in 2015 compared to 2000, while kilometers traveled by passenger cars were only 5% higher.